The Month of Ramaḍān is the month in which the first revelations of the Holy Qur’ān came down to the Prophet Muḥammad (Peace Be Upon Him). After your children eat the nuggets, tell them to keep the piece of paper to help them memorize this treasure. Along with using the Hersey’s Nuggets for their size, we are also using them because in English the word ‘nugget’ also means a tidbit of wisdom. Place two Nuggets on your cardstock and cut out. Use this template to cut out the rest of the rectangles. 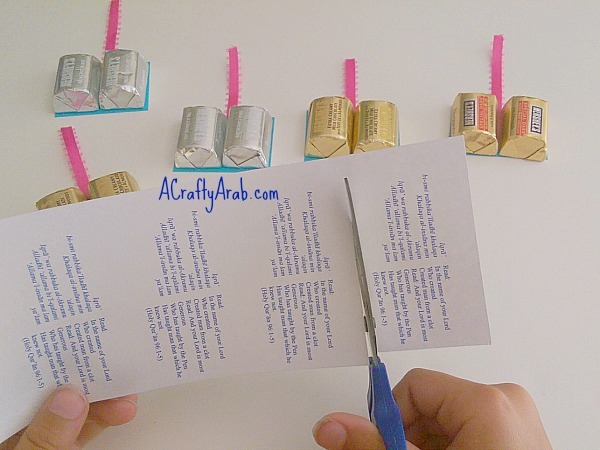 Put a dap of glue and place the ribbon down the middle of the cardstock. 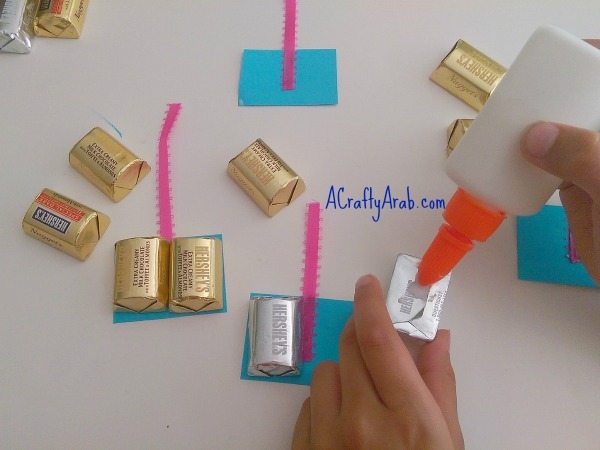 Glue the Nuggets to the cardstock, two on each one. I cut and pasted the words to the Sūrat al-Iqrā in a word document at a 7 size font and printed it out in columns. Cut them out in strips to fit over the Nuggets. Glue the Surat on top of the Nuggets and fold over the ribbon. 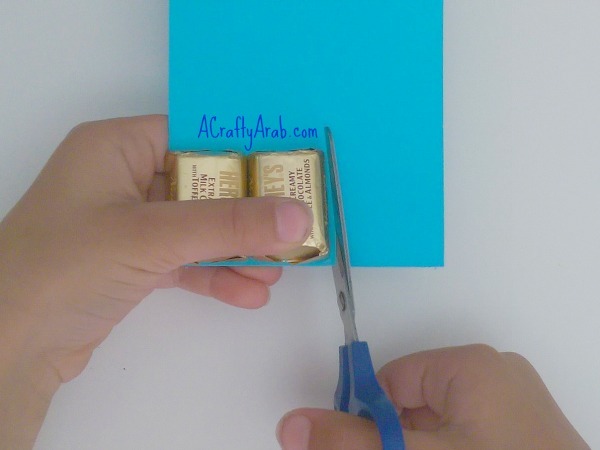 We also put a tiny bit of glue on the bottom of the ribbon, making sure it doesn’t cover any writing. 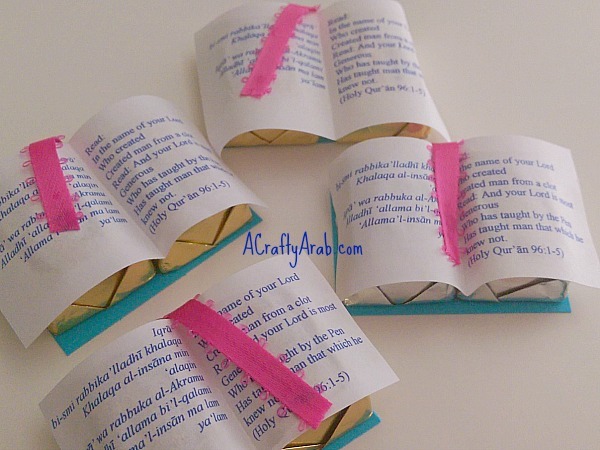 Your Quran Nuggets are all ready to hand out to the kids. 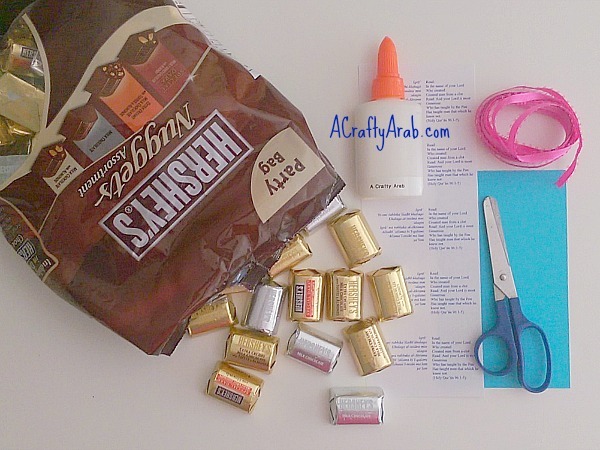 Be sure to stop by A Crafty Arab on Pinterest to see more of our DIY tutorials.